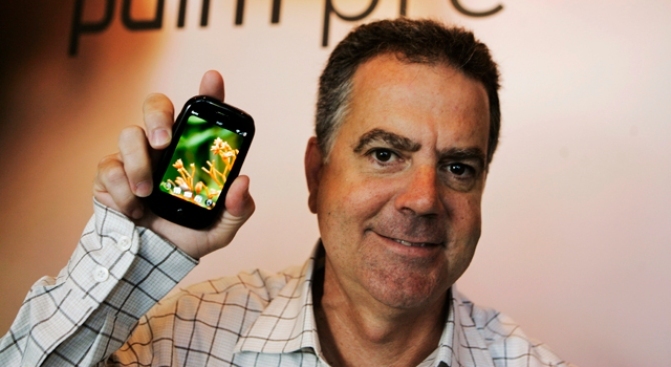 Palm CEO Ed Colligan poses with a Palm Pre at Palm headquarters in Sunnyvale, Calif. He's hoping to slap Apple in the face with his new webOS. Move over, iPhone. You've had two years on top of the smart phone world. Now there's a touch-screen phone with better software: the Palm Pre. In a remarkable achievement, Palm Inc., a company that was something of a has-been, has come up with a phone operating system that is more powerful, elegant and user-friendly. The Pre, which goes on sale Saturday for $200 (after a mail-in rebate) at Sprint stores, makes it easier to do more things on the go. With webOS, Palm's new operating system, you can keep multiple applications open at once. They're organized like a row of cards that stretches off the screen, and you flick the screen to switch between them. For instance, if you need to quickly check your calendar while writing an e-mail, you can bring up the calendar application, then flick back to e-mail, then keep switching between them as you try to work out your schedule. On Apple Inc.'s iPhone, you can run only one application at time. To switch between calendar and e-mail, you have to go back to the main menu every time. Also unlike the iPhone, webOS will notify you of events that need your attention, no matter which application you're in. Notification icons for e-mails, calls and over events appear at the bottom of the screen. If you tap on the e-mail notice, for instance, the message pops up. So webOS makes the iPhone look clunky, which is stunning in itself. It also thoroughly shows up Microsoft Corp.'s Windows Mobile. That operating system has had multitasking for years, but few users have appreciated that. Rather, Windows Mobile has been blamed for making phones clumsy and slow. Now, webOS comes along and does multitasking right. Also very cool is that webOS aggregates contacts and calendar items from multiple sources, like Google, corporate Exchange servers, and even Facebook. You know how lots of phones have space for a photo for each contact? The Pre automatically pulls your friends' Facebook photos into your contacts list. As far as the hardware goes, the Pre is well put together, but not exceptional. It's slightly smaller and chubbier than an iPhone, with softly rounded corners that make it look like a black bar of soap. The screen diagonal is 3.1 inches, noticeably smaller than the iPhone's 3.5 inches. Less screen space means it's harder to hit the right area with your finger, but the Pre makes up for this a bit by making the surface just below the screen touch-sensitive. For instance, to go back one level in a program, you swipe from right to left in this area. A keyboard slides out from underneath the screen. It isn't the best I've seen on a phone, but it does the job, and you'll find it much easier to use than the iPhone's on-screen keyboard. When I first got the Pre, I was dismayed by its battery life. I got less than 24 hours of light use out of it, and it would lose nearly a third of its charge if left inactive overnight. It turns out there's a bug that drains the battery if your Google instant-messaging account is connected to your AOL Instant Messenger account. Palm says it will fix that. When I logged Google out of AIM, I got much longer life. I extended battery life even further by setting the Pre to receive my personal e-mail instantly rather than checking every 15 minutes. That's counterintuitive — usually getting the e-mail automatically "pushed" to a device consumes more power. I ended up with nearly two days of battery life, which I think is acceptable for a hardworking smart phone. But it would be great if Palm made it easier to manage power consumption. That said, charging the Pre is almost half the fun, if you splurge on a $70 "Touchstone." You place the Pre on this small charging station, and it uses magic to radiate power through the phone's back. (The scientifically minded can replace "magic" with "electromagnetic induction.") It's a lot cooler than connecting a cable or a sliding the device into a dock, but it's only marginally easier to use than a cable, so consider this a luxury purchase. The Pre's camera captures 3-megapixel images. That's not an amazing resolution, but I prefer the Pre's camera over the 8-megapixel one in the Sony Ericsson C905, and every other phone camera I've tried. Why? Because other phone cameras have a big failing: It takes too long for them to take a picture after you've pressed the shutter button. They're impossible to use for action shots, or for capturing fleeting expressions. The Pre's camera has very little shutter lag. It's not as good as a single-lens reflex camera, or SLR, but it's better than a lot of digital point-and-shoots. The Pre also has the now-standard array of smart phone features: Wi-Fi, Global Positioning System and an online store for applications. The Web browser is very fast, given a fast data connection. You can zoom in and out on Web pages by pinching and spreading with two fingers, just as on the iPhone. The Pre has 8 gigabytes of built-in storage, same as the cheaper iPhone model. Uniquely for a non-Apple device, the Pre pretends it's an iPod when you connect it to a Macintosh or Windows PC with iTunes, so you can easily transfer your music library and photos to it. It won't play movies or TV shows bought from the iTunes Store, nor will it play songs that were purchased with usage restrictions. So should you get a Pre? Despite the fantastic software, this isn't a slam dunk decision. We also don't know what else Palm has up its sleeve. Sprint Nextel Corp. doesn't have the same lock on the Pre as AT&T Inc. does on the iPhone, so we may see the Pre with other carriers early next year. Palm has also said it plans to put webOS on a range of devices. We don't know when the next model will arrive, or what it will look like. Verizon Wireless' chief executive has said it will carry another Palm model "within six months." Lastly, Apple is expected to fire back by announcing an upgraded iPhone model, perhaps as soon as Monday. It won't be able to do everything the Pre can do, but it might have other novel features. Whether you get a Pre or not, its brilliant software will leave its mark on the phones you buy in the future, just like the iPhone did after its debut.